Tetra Active Substrate is a natural substrate which provides a suitable plant friendly base for healthy plant growth of aquarium plants. 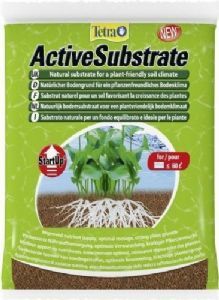 Offers improved nutrient supply and optimal rooting. The large surface and porous nature of the clay granules which make up Active Substrate offers several advantages compared to normal gravels. Wash thoroughly before use then fill your aquarium with a 4cm high layer of the substrate. For even better plant growth we recommend first using a base layer of 2-4cm of Tetra Complete Substrate. A 3L bag is suitable for a 30L tank. A 6L bag is suitable for a 60L tank.